If you are running one of the traditional "break-it and fix-it" shops, you may have begun to wonder how you could get into the much more lucrative business of selling IT managed services. You know that your client's would be much more productive if instead of reacting to a problem you could anticipate it and present the solution. That is, in a nutshell, what selling IT managed services really offers. It sounds like a reasonable proposition to you for your customers. The problem is always finding the best way to introduce it to them. That title pretty much sums up most clients response to the idea of offering preventative services to an IT customer. Your customers are comfortable with the current situation. You know what I mean, the one where they call you at any hour night or day to come and take care of their IT emergency. Preventative care might look good on paper, but convincing a client who is happy with the status quo is another matter. They simply don't see any reason to change. So how do you convince them otherwise? The first thing you need to do is let go of all the jargon. You clients aren't impressed that you can deliver patch management and anti-spywear or Softwear as a Service (SAAS). They care about whether this new offer will make their company run better and help them achieve better margins. When you can show them how it does, you will have their support. Always think in terms of your client's needs, and not the bells and whistles that impress you about providing this service. If someone offered the best service that money could buy, you would want that, wouldn't you? Well, so do your customers. When putting your package together, think of what they need and then make sure that what you offer is the highest quality for delivering what they need. Consider not only the technology but also the process and people needed to make this the best possible solution. When you make this your company's approach to offering this service, and let them know it is, you will find your clients will get on board with confidence. You will be tempted to try and offer this service to current clients for a price close to what they pay now. But to do this you will need to cut corners, lower your expectations on quality. This does no one any good, least of all your clients. Offer them a fair price, and show them what they get for it. What you are giving them is technology support that is high quality and gives them everything they need. It is up to you to explain that to them, not up to your client to figure it out. But once they do understand your explanation, they will learn the value of what you offer. Your clients won't believe in a service that you don't feel is up to par. You sales force should believe in it as well. In fact, selling this service should be their priority, above selling firewalls or servers. When they make selling your service contracts their priority, so will you. 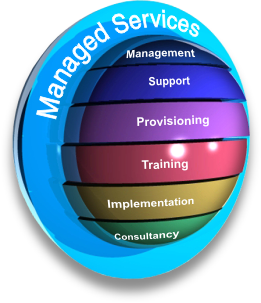 To be successful you need to approach offering managed services as your prime service. A big part of this is to also believe in change. It is part of the world of technology, and the bedrock upon which your managed services are based. Life changes, technology changes and the services that support them do too. When your clients have signed on to your managed services account they have the peace of mind that comes with knowing they will stay one step ahead of that change. When you offer them that peace of mind, the rest will fall in place. Obviously, here at EzPSA we feel that our own IT managed services is the one to use for all your client needs. We spent several years designing this PSA to work specifically for IT businesses. After years of looking for the right solution, I decided the only way he could get what I wanted for his clients was to design it himself. Luckily, with a background as a software architect and systems engineer, this was not as crazy as it sounds. In fact, it was such a successful design that we now offer it to others. Come by our site, check out what we have to offer and let us know your needs. We can help you to create the perfect solution for your clients, and get you into the world of the MSP today.